My staff and I are happy to welcome you in our modern hotel, which will make your transit very comfortable! 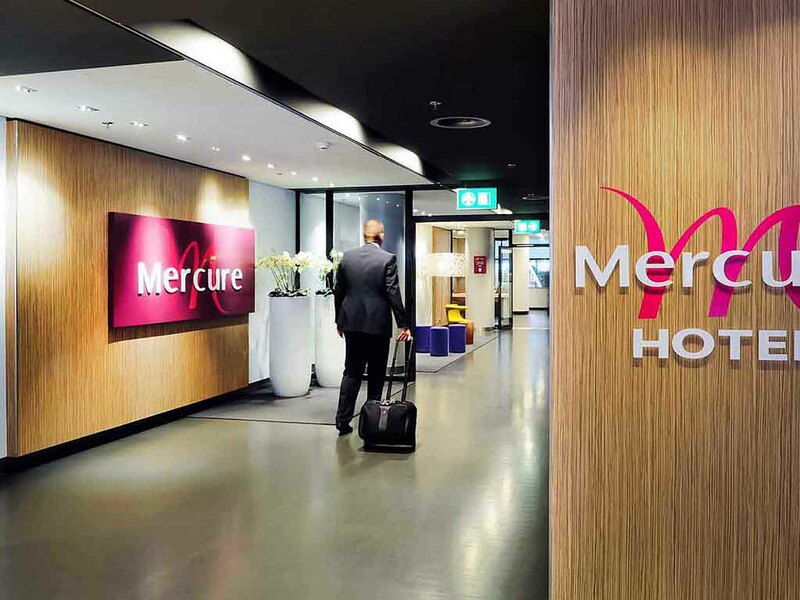 Our Mercure Hotel Schiphol Terminal offers you a refreshing shower and a nice bed so you can regain energy to continue your journey. Feeling good on the move at Mercure. Mercure Hotel Schiphol Terminal is a unique 3-star hotel in Schiphol Airport, located behind customs in the transit area of lounge 3, opposite the KLM lounge. To stay at the hotel, you need a valid passport and flight ticket for the same or next day. Both day and night rooms are available. IMPORTANT: you cannot access the hotel with check-in luggage and the airport is currently under renovation which could possibly cause construction noise during your stay in 2018. Mercure Schiphol Terminal is located behind customs and the Schiphol World Trade Center. At the airport, there is plenty of opportunities for culture, leisure and entertainment, such as the Schiphol Rijksmuseum. Or get pampered at the Amsterdam Schiphol Airport Spa and the Massage-O-Matic? Why not try your luck at Holland Casino Schiphol, enjoy some retail therapy in the airport shopping centre or download a book from the Airport Library? You certainly won't get bored at Schiphol. There are plenty of places to shop, buy a meal or have a drink. You can also go for a massage, visit the spa, try your luck in the casino, or look around the Rijksmuseum Amsterdam Schiphol. No transit visa needed for your stay. Located in the transit area of the airport. Day use and night use rooms are available. Private shower cabins for transit passengers. You can choose the room that meets your requirements, to ensure you have a relaxing night. Choose from our Standard Rooms and enjoy all the amenities they provide, including free WiFi. Rooms are OK and make for a good night´s sleep, but are fairly basic and overall bad value for money (e.g., no hand/body moisturiser in the bathroom). Absolutely no recognition of Le Club Platinum status (no welcome drink, no welcome amenity, no slippers in the room). Loyalty points were not credited automatically, either. YOU told me my reservation was canceled, but YOU got then reservations dates mixed up! You cursed me! The hotel cancelled our booking due to building works in the airport. We stayed at a Yotelair cabin, also in the airport. They also warned of building works, but we had a quiet uneventful stay. It was a wonderful convenience to relax, sleep and bath inside of airport security. Check in was kind. There is a noise problem all over - foot and rolling luggage from upstairs on the ceiling and especially from staff at 6AM right outside our door talking for 15 minutes and in the utility closet next door. We understand there will be renovations. Make sound-proofing a priority (for sleeping sake). Also: floor of shower extremely slippery (dangerous) and water fluctuated hotter and colder. An iron would be welcome (and perhaps a small microwave). Good luck with the improvements. We were glad to have stayed despite the drawbacks. Thank you. This was a wonderful option for a overnight layover. The room had everything you need (bed, bathroom, shower, tv). I was worried I would have a hard time finding it from reading all of the other reviews but it was actually really easy. Just follow signs to lounge 52, it's past the lounge, around the corner and up the stairs. You will see McDonald's and Jamie's Deli. The staff were friendly and helpful. I like to stay at your facilty , but when I try to book a later reservation for October it just shows the day use. It was exactly what I needed and hoped for. Our daytime stay was short, but welcomed after a long-haul flight. The reception staff were very helpful and polite. The room was located airside at this very busy international airport, but was very quiet and well laid out. We had everything we required for a few hours sleep and a shower before catching a connecting flight later that evening. Always stay overnight whilst making connecting flight. Sleep well. Refreshed. The hotel was a good place to rest and sleep due to an overnight transit at the airport. We did have trouble finding the hotel on information maps and had to ask at an airport information counter. We found the check in staff very friendly and helpful. The room was comfortable with a very clean ensuite shower. On the negative, housekeeping could do better cleaning along the carpet & skirting board around the room-it was very dusty and dirty. Couldn't stay with you. You 'forgot' to tell me that you had closed the hotel leaving me with the problems of finding a new hotel. Check-in easy but poorly signboarded. Nice neat simple room but first part of night ruined by construction noises from within (?) airport. Certainly won’t go again until that’s sorted out. Was able to check in early for a 6 hour stay during the day for a long layover. The room was a compact double which was clean and comfortable. The bathroom was adequate and clean. All in all a perfect accommodation for a long layover. The staff was friendly and accommodating. Would definitely use this hotel again under similar circumstances. I booked a twin room with an arrival date of the 17th Feb and a departure date of the 18th Feb which I naturally assumed meant staying a night. The website returned with a twin room selection that I chose. However, when I arrived at the hotel I was told (written in small print) that it was a day room? A night room was more Euro. I had no alternative but to book the night room. To my surprise it was the size of a shoebox with a really loud fan that kept me awake all night. I felt that it was all a con to force you to stay in a shoebox. Very clean, great service, and convenient. Again the staff was very courteous, the room was comfortable and clean and it is a very convenient location for a nights stay when waiting for a connecting flight the next morning.